I got this bowl at the dollar store and made it super cute! All it took was a little red permanent vinyl. Have fun with all your projects…we want to see pics. Silhouette. Here is a post on why we like the Silhouette craft cutter. We LOVE how you don’t’ have to buy cartridges. We LOVE their customer service. We LOVE how projects turn out using the cutter! Okay here is the low down on vinyl. This is what is sold at craft stores for your cricut machine. It is removable and it is a little thicker. It is NOT permanent. Great for general crafting. This is vinyl you’d use out side. Transfer Paper – you really need this to help things stay even so that your crafts look more professional. For small projects you can use painters tape (the blue kind at the hardware store). A million thanks for this post, and for the links to the other two sources! I finally feel like I know what to do and how to do it! Again, thanks for the legwork. It is appreciated. Does expressionsvinyl.com not sell the permanent vinyl you mentioned? I went to their site and didn’t see it. Should you not use the oracal 631 on things like coffee mugs and platters?? They got their order in today and will be posting it soon. Email them and ask them about it. The 631 will wash off of your mugs and plates. You could use it for a one time shot, but take it off before you put it in the dishwasher!!! They said they ordered in a bunch of the 751 and 951 just for ‘HowDoesShe’ readers. Just email them and let them know what you are looking for. Thanks for your comment! Let us know if you have any other questions! Hi I was wondering which vinyl,color and font you used for your super cute mugs. Thank you SO much for this post! Thanks to your post on the Robert’s Crafts Cyber Monday Cricut special, I just bought one and am ready to use it! I can’t wait! Do you know know if there are any hardware stores that sell the permanent vinyl as well? Like a Lowe’s or Home Depot? I have not seen vinyl in hardware stores, but you can check out your local craft store! I’ve seen it there! Show us your projects! Congrats…You’ll save a ton on gift giving! Thanks so much for the sources and info! It is much appreciated! Happy Holidays to you! Thank you so much for the links! I, too, found out on your site about the Robert’s deal on the Cricut, and picked one up. I’ve been dying to make a few things I’ve seen around the blogosphere made with vinyl. Awesome! I’m so excited. I just placed my order at Expressions Vinyl for the permanent vinyl. 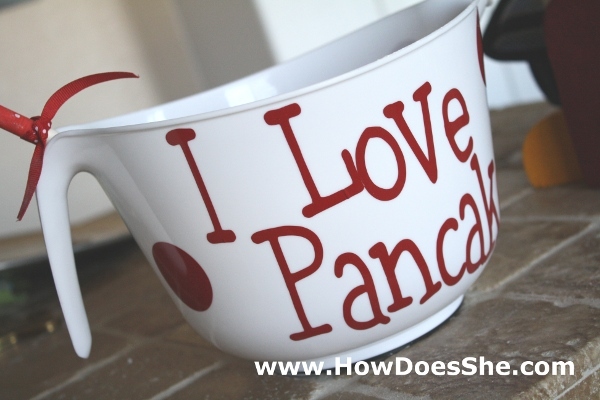 Can’t wait to get it and start “playing!” It was fun to see your pancake bowl on their site! I know, I know, this is probably such a stupid question, but I don’t know the answer so I am asking- What is the transfer paper, and what kind of things do you use it for? Transfer paper…it is so you don’t have to take off one letter at a time. You put the transfer paper (it’s like tape) over the cut letters, rub over the top and then lift the transfer paper off. The letters will stick to the transfer paper and then you can place it where you want it. It will keep your letters in a straight line and evenly spaced! You are such a huge help in the way you explain these things! thank you! ! A little birdie told me that I was getting a Cricut for christmas 🙂 THank you for posting this because I have read on some sites that the cricut doesn’t cut vinyl well, but this made me so excited cause now i know I can woot woot!! I am off to go vinyl shopping! How about a little video tutorial on using vinyl with the cricut?? 🙂 I’m a little nervous to try it. Do you adjust your blade? Oh, and did anyone get a better deal than they expected from Roberts on Cyber Monday? I was the one that posted the code for 30% off the sale price – my total for the Personal Cricut, Christmas cartridge, and shipping was $100. But when they shipped it, I saw my invoice and they only charged me $70! Machine, cartridge, and shipping. Crazy huh? My only regret with not getting the Expressions is the little one doesn’t cut fonts small enough – I’ve been trying to make gift tags but they have to be really big to fit the one inch lettering. Otherwise… so much fun! Working on a Xmas countdown and the photo ornaments next. Thanks again for all the tips! I know there is a bunch of videos on UTube! Just search vinyl and Cricuts. There are lots that will tell you how to do it and how to adjust the settings. Great job on the cricut deal! We’ve thought about videos, but we don’t have the equipment yet! do I need to have a cricut in order to create things with vinyl? No…you can order it from a vinyl company and they do all the cutting, tweezing and backing for you! Let me know if you need a company. hi again, Allison! lots of thanks for the email. anyway, are sticker papers similar to vinyl? just wanna makesure 🙂 and can I use the transfer tape like over and over again; or I have to use a different one everytime? you’re welcome! sure, will post my blog URL up here when I have done something =) you have been very helpful, thanks once again. I am still searching for vinyl though, since it seems there’s none here in my country. so I guess I MIGHT order from oversea for supplies. hey there 🙂 I really really LOVE those vinyl’d stuff.. so just wondering, can I print out words on the vinyl using an ink-jet printer(usual desktop printers)? or.. do I really need to have a cricut/any special printer for vinyl? oh yes.. sure, if there’s a company you know that can supply them at cheap prices that’ll be nice. Is the “black boys on Mopeds” font the name of the cricut cartridge? Is that the same font used on the pancake mixing bowl? Thanks for all the info and GREAT ideas!! Thanks for your comments &Questions!! What is a vinyl cutter? Not your typical crafters machine I assume. More professional? A vinyl cutter is a professional cutter. A good one starts at round $1,000. 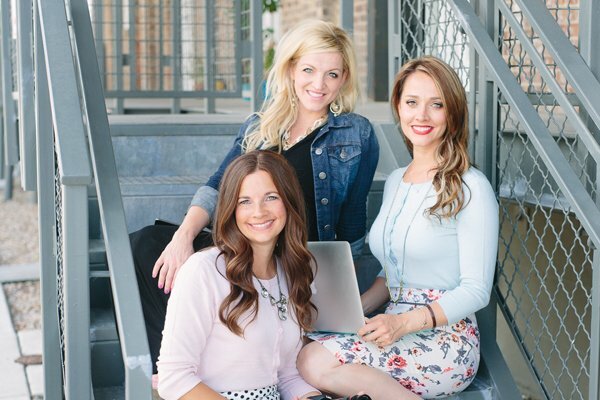 They are great if you are going to start a craft business or do craft shows! The Cricut is a smaller one for crafters. These run $80-$350 and you can get these at any craft store (Michaels, Roberts, Hobby Lobby, etc.). Does this answer your question? Let me know if you have others! ok i am confused.. i want a silhouette … but does it only cut vinyl? i do scrap-booking and want to do a bunch of vinyl, i assumed sillhouette was the best but here it seems circut is.. any suggestions? i have a computer and (a mac) and do not mind using it… thank you.. It does vinyl, paper, tattoo paper, magnets…both machines are wonderful. They do a lot, but we like the silhouette because you don’t need cartridges. There is not more cost after buying a cutter because there are so many free ones online. Hope that helps. Do you have any experience with Sure Cuts A Lot? Nope! Do you have one? I’ve finally found vinyl!! here in my hometown:) but too bad I dont own any vinyl cutter:( anyway, the vinyl that I’ve found is shiny in colour.. have I got the correct kind of vinyl? Shiny will work perfect! Matte is another option too! Thanks for asking!! Where did you buy your white mugs? Can anyone give me advice??? Thanks! I am in love with the Silhoutte. I picked this machine over the Circuit because of being able to download all the different stuff right over the internet and not have to buy the cartridges. How she does it got me into this and buying it. Really watch HDS they are super great with ideas. You have me seriously wanting a Silhouette, but I have a question I hope you can answer. My local craft store now sells vinyl by the foot! Can I use that with a Silhouette machine or do I have to buy the Silhouette brand vinyl rolls? So, what kind (brand) of vinyl is compatible with the Silhouette? i just bought a silhouette cameo…it is still in the box. I have been clicking one image after another on your site, drooling over the wonderful and creative items you made. I could sit here for hours….it is so much fun. I am sure that this will be one of many emails, but i just have a couple of questions…when you make the mugs with names or use etching cream, how to use wash them? do you need to seal it with anything? thanks so very much for the inspiration and ideas. New projects – so fun! The etching cream will have all the directions on it about washing and for the mugs, make sure to use the more durable vinyl mentioned in the post and then hand wash. I have a cricut and have been trying to make the cute insulated cups with peoples names on them. The one thing i cant for the life of me figure out is how do you transfer the name with the transfer tape and make it strait!! You know like how you did on the cute pancake bowl. Since cups are smaller when you lay the name on the cup it curves! Do you know what I mean?? I hope you do and you can help me solve this dilema!! I soooo want to try to make some of the cute stuff but I’m hung up on trying to transfer names to small curved surfaces…. PLEASE HELP ME!!! Love this, do you know if the 951 will work in a Cricut machine? I use clear contact paper for transfer paper. Cheap and works great!!!! Now when you add the vinyl to the coffee cup, can you put the cup in the microwave after? I want to make these for gifts, but I put my cup in the microwave to warm my coffee up everyday and just want to make sure it’s safe, thanks! I know you asked the question a bit ago but thought I would post for future searches. I chatted with a Silhouette rep and she said their vinyl is not microwave safe. She recommended using it as a stencil & using porcelain markers to color it in and then bake it in the oven. Where did you find the oracle 751 or 951 at.. I love the things I have read, but that pop up at the bottom with the blinking error is driving me to leave…. do in the BCBGMAXAZRIA Fall 2013 collection debuted on February 7. I saw you put that oracle 651 is for outdoor use, will id hold up well on a coffee mug or so you only recommend 951? I’d stick with 951 for coffee mugs. Thanks! I was wondering if you have tried the expressions vinyl brand of permanent vinyl, the number is 51. I just received it and put it on a coffee mug but I’m not sure how it will hold up in the dishwasher? Do you seal your vinyl with anything after applying it to cups and plates? Hi… I was just read on a crafting blog that I should be putting some sort of sealant on my aluminum tumblers. I use 651 vinyl on almost everything. I just started using the aluminum drinking tumblers from Hobby Lobby for my projects. I do use the oracal 651 vinyl. Question? Should I be putting a sealant on them?